Meow! is proud to be participating in an exciting charity event, the annual En Couture Fashion Show. 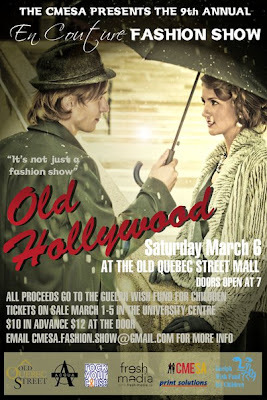 This year's show takes place at the Old Quebec Street Mall, Downtown Guelph, on Saturday March 6. The multi-media show will spotlight local boutiques and designs and features musical set pieces with tons of glamour and the volunteer efforts of many University of Guelph students. Please think about attending this fabulous fun event. Advance tickets are just $10 and all proceeds go to a worthy charity. The theme this year, just in time for the Oscars, is "Old Hollywood" --a subject close to Meow's heart. We were happy to provide outfits for the photo shoot for the posters for this event as well as for the fashion show itself. Check out the facebook group "CMESA En Couture Fashion Show 09/10"
En Couture Fashion Show March 2010. This year's show promises to be an exciting and eventful occasion featuring the latest fashions from local boutiques and shops. The show is geared towards promoting the locality of Guelph and it's surroundings all while raising proceeds for a wonderful local charity. The charity En Couture has chosen to raise money for this year is the Guelph Wish Fund for Children. Founded in 1984, the Guelph Wish Fund for Kids is an entirely volunteer organization. They give over 95% of all funds raised towards granting wishes of local children who are 19 years of age or younger who life with a serious or life-threatening illness, a severe handicap, or who have been critically injured. The hope is that the wish that is granted will help the child, even if only for a short period of time, feel relieved of the pain and anxiety dealt with in their every day life. August 2009 was the Wish Fund's 25th anniversary and En Couture's goal this year is to raise as much money as possible to help make their 25th year a year they'll never forget! To help us do this, we are teaming up with a business called Rock Your Cause™! Rock Your Cause™ is a marriage of couture and cause, designed to compel people to, well rock their causes! Through the sale of their Orange Logo™ apparel they raise funds and awareness for various philanthropic organizations. Through their Colour Your Cause™ campaign they work with students of all ages, as well as companies, and even individuals hold fundraising events and run cause campaigns of their own. Rock Your Cause™ is "philanthropy that fits perfectly!" and they are looking forward to being a part of this years University of Guelph CMESA En Couture Fashion show. For more information visit their website www.rockyourcause.ca, their Facebook group, and fan page.